The FHREC consists of representatives from all FEHD departments. It ensures that the design of all research by Taught Postgraduate students complies with the university’s requirements for the ethical conduct of research. 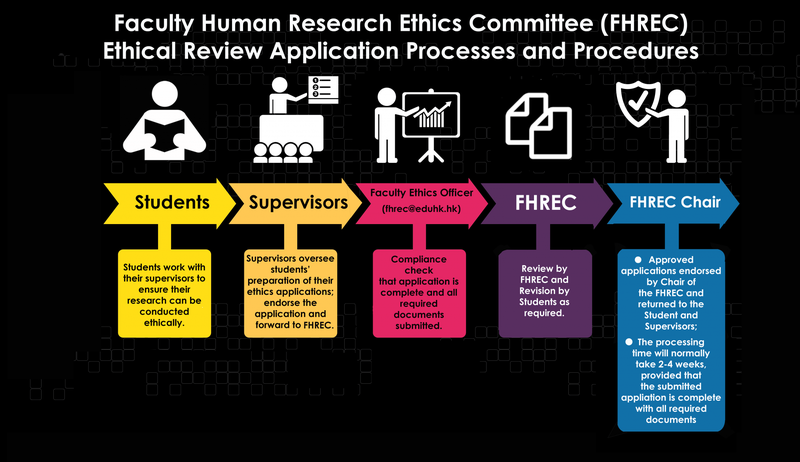 Who should apply for FHREC Review? Taught Postgraduate students doing research with human participants and/or human data, including data collected for a previous project, must submit an ethical review application, irrespective of whether the research is funded or unfunded. Ethical approval must be obtained before the commencement of data collection. Data collection form, including questionnaire (if applicable). For studies involving interviews and/or surveys, a sample (draft) interview script/ protocols/ data collection form and/or questionnaire should be submitted for consideration. If the full/ final version is not available, please provide examples of questions that will be asked. For studies involving data collection/ research sites, an informed consent form (with information sheet)/ invitation letter for the research site (e.g. school) should be used and submitted for consideration unless justification is provided. Avoid inconsistent information between ethical review documentation and the research proposal, or between the bilingual forms. Simple language should be used. Jargon or research terms, which the person signing the form may not understand, should be avoided. Consent forms and information sheets should provide research participants with sufficient and clear information that allows them to make informed consent to participate in the study. You may follow the suggested consent form and information sheet format here. Description of how results will be disseminated. FEHD follows the international criteria for research authorship established by the International Committee of Medical Journal Editors (ICMJE). The same criteria are used by major academic societies, such as the American Psychological Association (APA), publishers, such as Elsevier, Taylor & Francis, and national policies on Academic Research Conduct and Misconduct in countries such as England, Australia, Canada, and New Zealand. Who can be listed as an author? Only individuals who meet the following four criteria are entitled to be listed as an author of any publication, regardless of its form or where and how it is distributed. Who should be listed as a contributor to a publication? Anyone who does not meet all the criteria for authorship but contributed to the research should be listed as a contributor and their role specified. This might include an RA who drafted the paper and/or collected or analyzed data but not the conceptualization or design of the publication, or final review of the publication, or responsibility and accountability for the accuracy and integrity of the publication. What is the corresponding author? The ICMJE guidelines specify the role/work of the corresponding author as primarily administrative (see below) but must also meet the four criteria for authorship. The corresponding author is the one individual who takes primary responsibility for communication with the journal during the manuscript submission, peer review, and publication process, and typically ensures that all the journal’s administrative requirements, such as providing details of authorship, ethics committee approval, clinical trial registration documentation, and gathering conflict of interest forms and statements, are properly completed, although these duties may be delegated to one or more coauthors. The corresponding author should be available throughout the submission and peer review process to respond to editorial queries in a timely way, and should be available after publication to respond to critiques of the work and cooperate with any requests from the journal for data or additional information should questions about the paper arise after publication. Please read the 2020 UGC RAE Guidance Notes here. We have developed a set of online resources to support postgraduate students who are preparing research proposals or who are undertaking doctoral research. The project consists of a website with nearly 200 short videos. The videos show interviews with academics and research students, as well as supervisory sessions. Topics include types of research, research methods, thesis writing, managing research studies, and the perspectives of an external examiner. The videos feature academics and students from EdUHK and from other tertiary institutions. This online database is designed to facilitate innovative distance and blended learning pedagogies. The videos can be viewed on a PC, tablet or mobile phone. 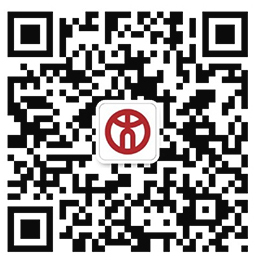 The website is best viewed using Internet Explorer version 11, Chrome, Firefox and Safari.